A very warm welcome to the Chinese Embassy. As you all know, tomorrow is the 65th anniversary of the People's Republic of China. It is a real pleasure for me to host this dinner for you on this special occasion. · And a member of the 'Thousand Professors' program. You all share a common bond. You are all friends of the Chinese people and supporters of China's development. Tonight I want to use five words starting with 'EN' to describe the significance of our gathering. First, "Engage". You are all experts in your own fields. Yet, the biggest thing you have in common is you all took a long journey to China. You all have work experiences in China. Some of you have worked and lived in China for years. You have close links with China and you deeply care about China. · Sir Richard's research on diseases related to smoking offered important scientific grounds for the Chinese health authorities' legislation on smoking control. · Professor Marie Harder's research in waste disposal and environmental management are of great value to China's environmental protection and sustainable economic growth. · Mr. Michie is highly experienced in cross-cultural communication. 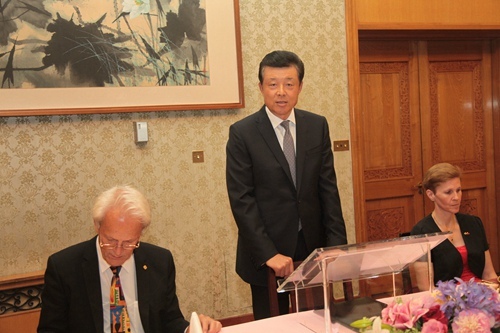 His skill and expertise have helped advance China's public diplomacy. · Professor Samantha Jenkins is specialized in chemistry and material physics. · Mr. Hope is an internationally renowned car designer. · Professor Owen is highly accomplished in engineering. Your knowledge has enabled China's industrial upgrading. My third 'EN' is "Enrich". Every one of you may focus on an individual field. But together these fields have enriched China-UK cooperation. Therefore you are the practitioners and promoters of China-UK cooperation in science, technology, education and culture. 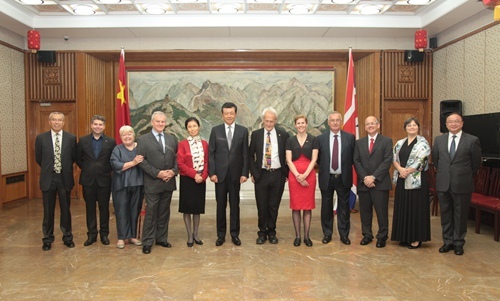 It is fair to say that your efforts made a big difference in deepening China-UK cooperation in a wide range of areas. Your contributions are directly reflected in the numerous highlights in China-UK relations. Fourth, "Entitle". Because of your contribution to China's development and China-UK relations, you are entitled to the respect of the Chinese people and the honors given by the Chinese government. At present, China's development has entered a new stage. The Chinese people are working to achieve the two centenary goals and the 'Chinese dream' that features national prosperity and a happy life for the people. To this end, we need all the more to draw on the strengths of other cultures and civilizations. We must learn from the most advanced science and technology of the world. We need all the more the advice from foreign experts and scholars. Therefore China is grateful to you. China also welcomes and hopes for your continued participation in China's development endeavors. We welcome and hope you to help enhance China's development capacity, enrich China-UK and China-Western cooperation and advance China-UK and China-Western relations. Finally, I want to say "Enjoy". As you see China as your second home land, then the Chinese Embassy is your second home. I once again welcome you for home-coming. Let us enjoy this evening. In conclusion, I wish to propose a toast. To the 65th anniversary of the People's Republic of China! To a stronger China-UK relationship! And to the health of all present!